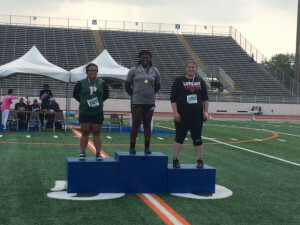 The Lovejoy Leopards Boys and Girls Track and Field teams competed at the 5A Region II Track and Field Championships at the University of Texas at Arlington on April 28th and 29th. Two athletes qualified for the UIL State Track and Field Championships to be held May 11th – 13th at the University of Texas in Austin. Chase Van Wagoner reserved his place in the State Track and Field meet on day one with a runner-up performance in the Long Jump competition. Van Wagoner’s jump of 23’ 2.75” on his last attempt in the finals, broke his own school record, set at the Allen Eagle Relays by a quarter of an inch. Grace Ridgeway secured a return trip to the State Meet (finishing 5th in 2016) on the second day, by winning the Pole Vault competition with a height of 11’3”. In other field events, Katie Hale finished 3rd in the Shot Put with a throw of 38’1”, James Rainey had 10th place finishes in the Shot Put (43’5”) and Discus (137’3”), and Colin Engbrock cleared a height of 13’6” in the Pole Vault, finishing 6th. 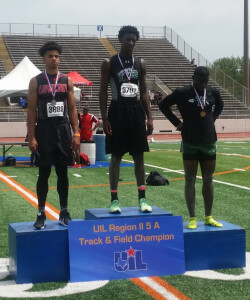 State Qualifier, Chase Van Wagoner (left) finished as runner-up in the Long Jump with a jump of 23’2.75″. The Leopards Boys’ team competed in 8 of the 11 running events. Bradley Davis and Ryan Brands competed in the 3200m. Davis set a personal record with a time of 9:46.54, finishing 7th. Brands finished 12th with a time of 10:02.30. The 4x100m Relay team (Beau Iovinelli, Jake Chamberlin, Landon McDermott, Chase Van Wagoner) finished 6th overall (42.43) after lowering their school record to a time of 42.02 in the prelims. The 4x200m Relay team (Iovinelli, Ryan Gordon, McDermott, Chase Van Wagoner) also set a new school record in the prelims with a time of 1:28.43 before finishing 6th overall (1:30.21) in the finals. Chamberlin ran prelim times of 49.49 in the 400m and 21.84 in the 200m, qualifying for the finals (400m – scratched, 200m – 7th, 22.51) in each event. In the 1600m, Brands finished 4th with a time of 4:33.14. In other running events, Tyler Van Wagoner ran a 15.49 in the 110m Hurdle prelims and Chase Van Wagoner ran a 10.85 in the 100m prelims. 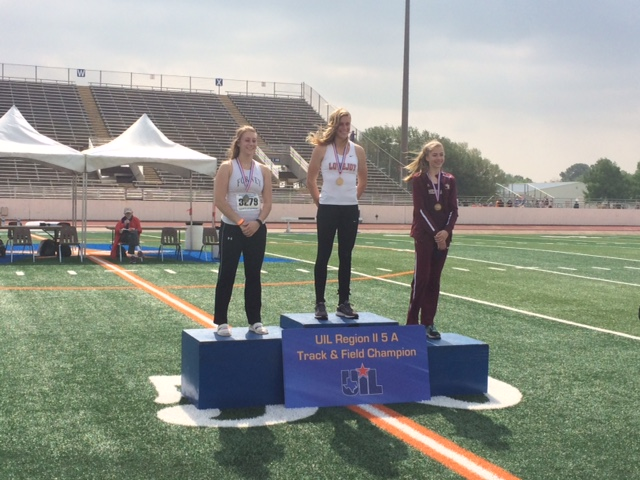 State Qualifier, Grace Ridgeway (center) won the Pole Vault event, clearing a height of 11’3″. The Leopards Girls’ team competed in 6 of the 11 running events. Carson Hockersmith, competing in two events, finished with a time of 2:22.16 in the 800m to finish 7th overall and a time of 5:34.86 in the 1600m to finish 10th overall. Juliet Franz qualified for the finals in the 100m Hurdles with a prelim time of 15.14 and finished 4th overall with a time of 15.50 in the finals. In the other hurdle event, Ridgeway qualified for the finals with a time of 45.35 in the 300m Hurdles prelims and finished 5th overall with a time of 46.96 in the finals. In the two relay events, the Leopards 4x100m Relay team (Lacey Pelkowski, Kassidy Litchenburg, Taylor DeCarlo, Carsen McFadden) ran a time of 50.31 in the prelims and the 4x400m Relay team (Kassidy Litchenburg, Carsen McFadden, Emily Piccirillo, Carson Hockersmith) ran a time of 4:05.50. Katie Hale (right) finished 3rd place in the Shot Put with a throw of 38’1″. A total of nineteen athletes, 10 boys and 9 girls, competed for the Leopards in 20 events.